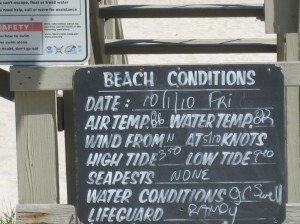 This week’s number in the real world is lifeguard station numbers. As the temperature starts to plummet here in Colorado, my attention turns towards the beach. 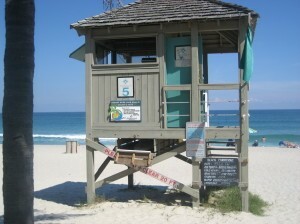 The average temperature in Denver on October 21st is 60 degrees (it hasn’t plummeted too much yet); in Jacksonville it is 78 degrees; in Fort Lauderdale (where I took this picture of the lifeguard stand), it is 83 degrees. Average lows on this date in these cities are 40, 64, and 75, respectively. There will be no sunbathing at the ocean in Denver on October 21st! There will be no sunbathing at the ocean in Denver on any day of the year. But some months it is warm enough in Denver to sunbathe by a reservoir or swimming pool. This lifeguard stand is full of interesting numbers as the next picture shows: date, air temperature, water temperature, wind speed, high tide time, low tide time. But the really good information on this sign is that there are no sea pests. Don’t you just hate going to the beach and discovering sea pests on your towel, under your feet, and in your suit?! I thought sea pests would refer to the aforementioned sharks, but according to my 5- second Google research, sea pests refer to jellyfish, man-of-wars, and/or sea lice. When sea pests are present, a purple flag is flown from the lifeguard stand. Maybe Colorado needs a warning flag system. We don’t have ocean beaches, but we do have mountain trails. I’m aware of one warning flag — the red one which indicates fire danger. Colorado should also have purple flag warnings which would indicate mountain pests as in lions (mountain), goats (mountain), and bears (black). Oh my! Whether on a beach in Florida or on a mountain in Colorado, make this week count! And stay away from pests of all kinds!